Poaching fruit is a healthy way to prepare fruit for a dessert. We recommend using hard fruit such as apples, pears, peaches, plums and kiwis as the liquid will soften their texture. Using over-ripened fruit won’t work well – the texture may fall apart and result in a mushy mess. No thank you! Once you have chosen your fruit – we are using apples and kiwis for this recipe but you can choose any fruit you like – cut the fruit in half or quarters. Since we are using the Synchro cooking function which you can find on any Tiger Multi-Cooker, there is no need to bring the ingredients for the poaching liquid to a boil. What we are going to do is make rice and use the steam from the rice to poach our fruit. Genius! Put all the ingredients on the Tacook steaming tray, place it on top of your inner pot (where the rice will be sitting), close and choose the Synchro-Cooking function. Press start and grab a glass of wine. Once you make poached fruit once you won’t be able to stop – not only is it easy to make, it’s also healthy and delicious! Looking for something healthier for dessert? Something easy to prepare that your family is going to love? Look no further, we have the perfect poached fruit recipe for you! Poaching fruit is a simple method that’s extremely popular in France. 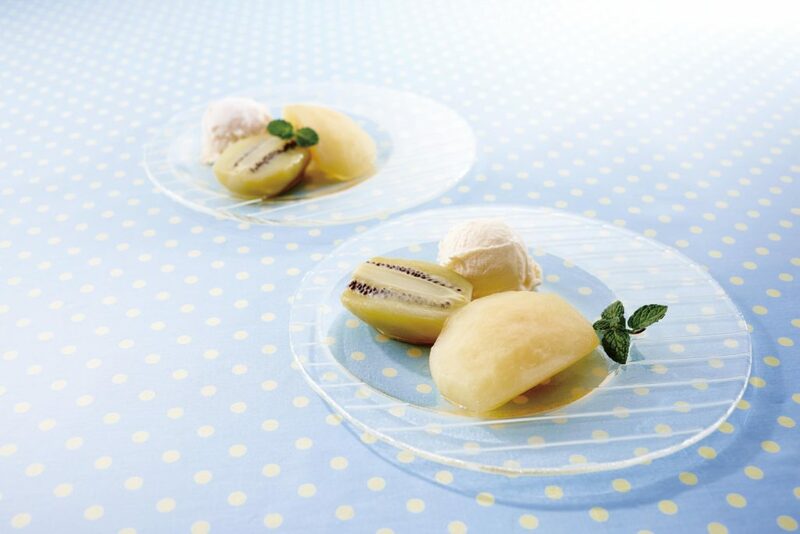 I’m sure you’ve heard of the classic poached pear dessert – the pears are cooked in a simple syrup made with sugar, spices and wine. They are left to simmer until some of the liquid has been absorbed and the texture is tender. It’s become a staple in French cooking, a dessert almost as famous as profiteroles. We have come up with something similar except that we’ve simplified the dish and swapped the pears for apples and kiwis. And boy is it delicious! Peel the kiwi and cut in half lengthwise. Peel the apple, cut into fourths and remove the core. Place the fruit in the tacook cooking plate and sprinkle with sugar, lemon juice and white wine. When cooking is complete, place the dish on a serving plate. Cool it down in the refrigerator and serve with mint leaves and ice cream.